Bridge House Stud was established in 1998 and prides itself on being a family-run operation that offers a personal service to its clients. Centrally located, just outside Mullingar in Co. Westmeath, and just over 1 hour west of Dublin airport, it is also easily accessible from all parts of the country for mares travelling to other stallions. Situated in the heart of farm land traditionally known for fattening beef, the stud has been restored and developed by the Badger family since its purchase in 1997. 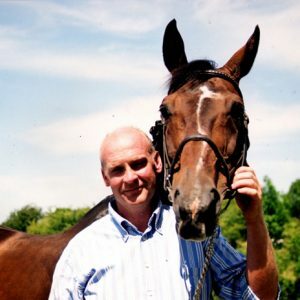 Having studied Agriculture in Northern Ireland and Scotland, Trevor Badger brought knowledge and experience gained from working in studs in the Southern Hemisphere, Canada and Europe, and together with his expertise in orthopaedic farriery, equine husbandry and fertility he has established a provenance across the equine industry of Ireland. The stud has a longstanding, highly professional and experienced team to support its offering to clients of a complete package from conception to market place. You are very welcome to contact Trevor directly and find out how Bridge House Stud can support your breeding plans.